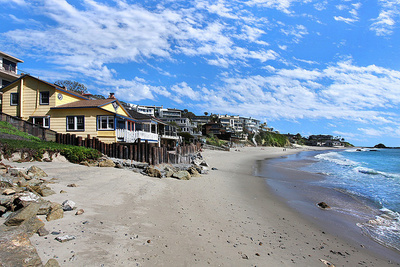 Naturally, waterfront properties offer some of the most breathtaking real estate available in Orange County. The mighty Pacific Ocean affords the so-called "Gold Coast of California" with over 42 miles of coastline which provide an abundants of waterfront homes for sale. The Pacific Coast in Orange County is favored with such spectacular vistas that some observers have been impressed enough to dub it the "California Riviera"! Read more about Orange County waterfront real estate below the following homes for sale! 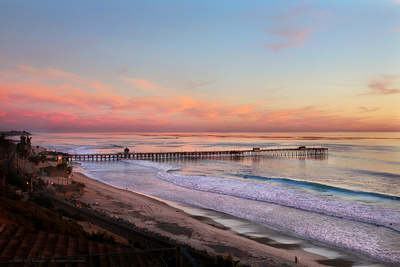 Property for sale along the Orange County waterfronts of San Clemente, Dana Point, Laguna Beach, Corona Del Mar, Newport Beach, Huntington Beach, Seal Beach, Sunset Beach and Long Beach range from enormous mansions to single family homes, and from multi-family residences to high-end condominiums. Harbor homes, ocean front homes, and lake front homes for sale in Orange County all offer access to some of the finest and most popular waterfront in the world. Of course, anyone who is seriously interested in purchasing waterfront property in Orange County will recognize that this kind of Real Estate simply commands higher prices than most other areas. After all, the Gold Coast of Orange County offers some of the most sought after Real Estate in Southern California! However, because of the prestige of waterfront homes in this area, owners can rest assured that they truly are in possession of something valuable and extraordinary. In addition to the inherent beauty and long-term value of Orange County waterfront property, the area itself is the home of some of the world's most popular and enjoyable attractions. These will include the Disney Resort and California Adventure, Mission San Juan Capistrano (also known as "The Jewel of the Missions"), and Knott's Berry Farm. The waterfront cities and towns in Orange County are a great place for many people looking for first-rate property, ranging from communities that are perfect for those who appreciate a true, laid back Southern California lifestyle--but with all of the amenities Orange County is known to possess. Others are significantly more developed, but all the while retain a distinctly relaxed lifestyle. 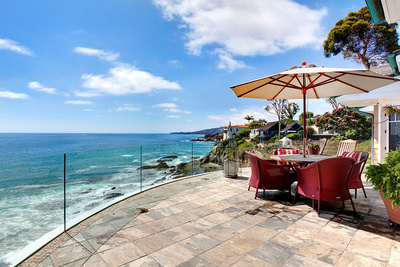 A favorite Orange County community that offers waterfront homes for sale set on the pristine South Coast is Laguna Beach. This area has become something of a site for art lovers. Laguna Beach now draws large numbers of area residents and tourists each summer to attend the local Art-A-Fair, Festival of the Arts, Pageant of the Masters, and The Sawdust Festival. To the north lies the wonderful city of Huntington Beach, also known to the locals as "Surf City." This waterfront scene is recognized internationally as one of the hubs of surfing, thanks in part to the fact that Huntington Beach hosts a number of major surfing competitions--including the U.S. Open of surfing. Even in the winter, the waterfront of Orange County is a great place to be. The beachfront glistens as Huntington Harbor, Newport Harbor, and Dana Point Harbor all get into the holiday spirit to brighten up the winter nights with festive boat parades. All three of these cities-Huntington Beach, Newport Beach, and Dana Point-are tremendous waterfront locations that offer extravegant waterfront homes for sale for the best in seaside living. Indeed, Corona Del Mar lives up to the very embodiment of its name: "Crown of the Sea." All along the 42 miles of scenic Orange County coastline, and inland at points like the twin lakes of Lake Forest, waterfront properties provide some of the finest residential options for sale in California. It is also no secret that Orange County features true excellence in education, beginning with first-rate private Montessori offerings and award-winning preschools and elementary schools for the younger set. In addition, the public high schools in Orange County regularly rank among the top schools in the United States. Of course, Orange County also has prestigious private colleges along with University of California campuses to provide undergraduate, graduate, and professional programs of all kinds. The fact that Orange County offers excellent business options-not to mention a very reasonable round trip commute to Los Angeles-only adds to the waterfront's real estate appeal. Add the practicality of the proximity to business together with the almost unlimited recreational opportunities, and Orange County waterfront Real Estate becomes almost unbeatable. Truly, quality of life is Orange County's greatest resource, with amenities that run the gamut from some of the nation's best golf courses, to countless miles of biking, hiking, and equestrian trails, this area has it all. The Orange County waterfront real estate experts at The Aaronson Group can connect you with the absolute best properties in California. Call 949-388-5194 to find out more.